After activating BuddyPress, you will be automatically redirected to the BuddyPress Welcome Screen if this is the first time you’ve activated BuddyPress or if you’ve just upgraded BuddyPress. After taking some time to check out the new features added to the plugin, go to Network Admin menu > Settings > Components to begin configuring your installation. By default, BuddyPress Core and the Members components are enabled (Must-Use). Extended Profiles, Account Settings, Activity Streams, Notifications, and Site Tracking components are activated for you. You can however, selectively disable/enable any of the components later if you so choose by using the same form. Your BuddyPress installation will continue to function. However, the features of the disabled components will no longer be accessible to anyone using the site. Each component has a unique purpose, and your community may not need each one. Let your users make connections so they can track the activity of others and focus on the people they care about the most. Allow your users to talk to each other directly and in private. Not just limited to one-on-one discussions, messages can be sent between any number of members. Global, personal, and group activity streams with threaded commenting, direct posting, favoriting and @mentions, all with full RSS feed and email notification support. Groups allow your users to organize themselves into specific public, private or hidden sections with separate activity streams and member listings. 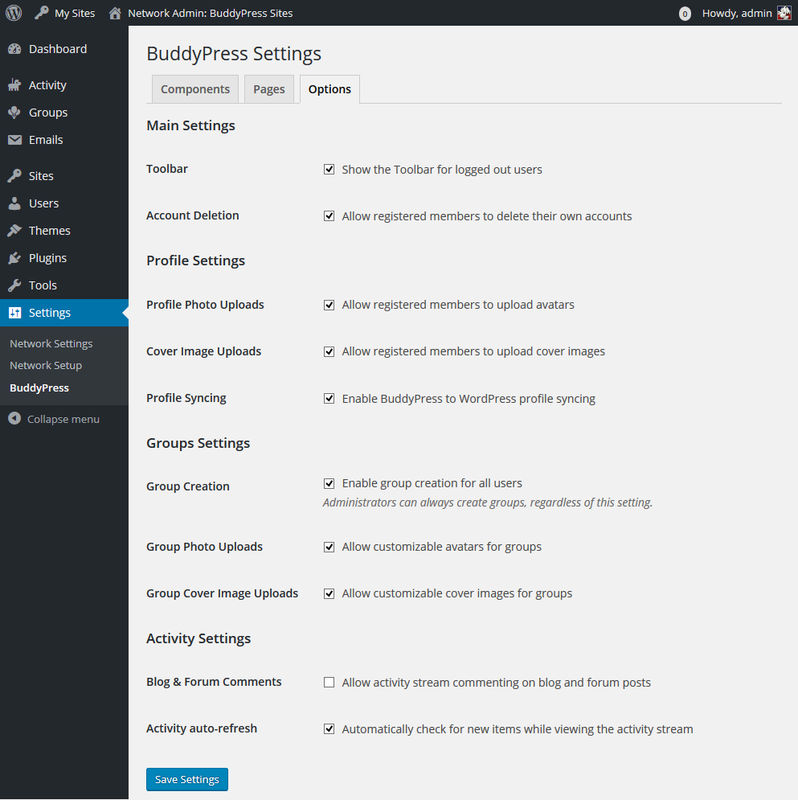 The following components are required by BuddyPress and cannot be turned off. BuddyPress Core: It‘s what makes [time travel] BuddyPress possible! 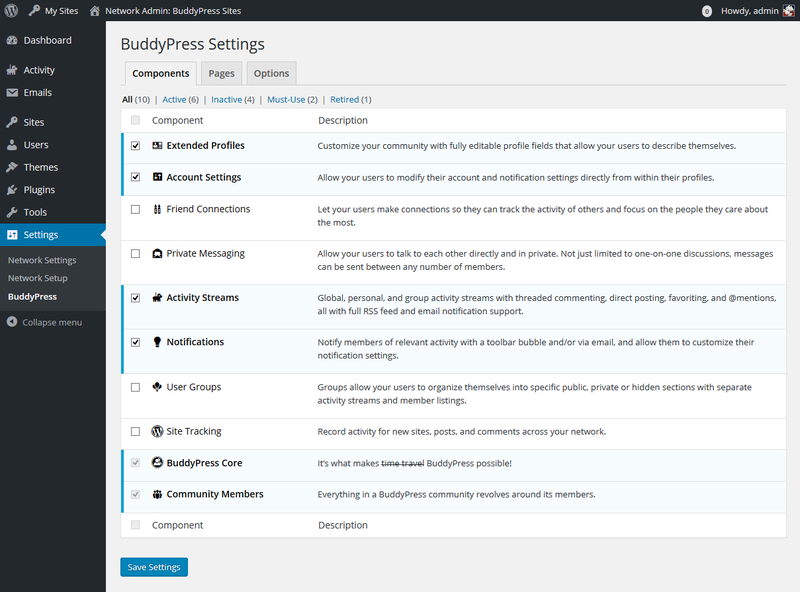 Community Members: Everything in a BuddyPress community revolves around its members. 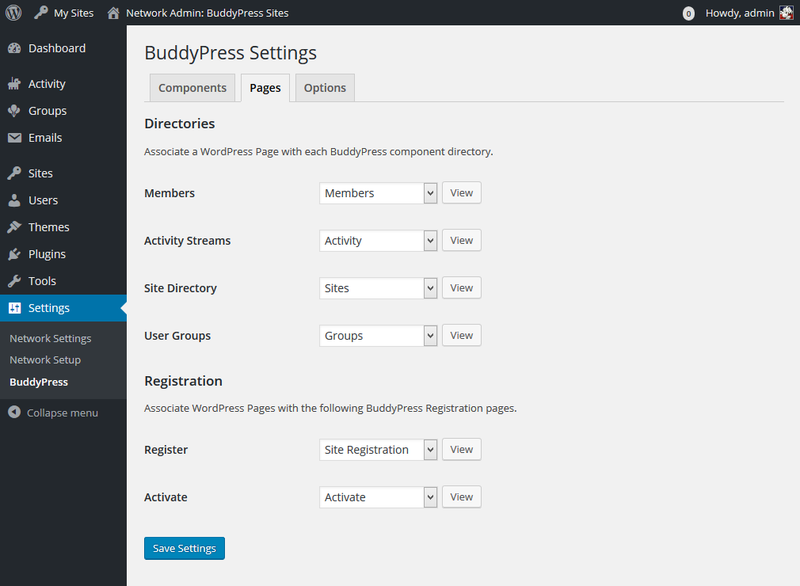 BuddyPress components are rendered as WordPress Pages. Make sure that activated components have corresponding pages assigned to each in this panel. Associate WordPress Pages with the following BuddyPress Registration pages if you want to enable registration. Administrators can always create groups, regardless of this setting.